Money Worth Its Weight In Magic! 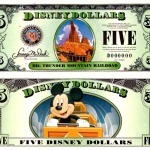 If you’re a long-time Disney fan you most likely know about or have heard of Disney Dollars. There’s something about having fresh crisp currency, but there’s also something even more special when it is infused with a bit of magic. So, what does one do with Disney Dollars? Well, you can save or spend them, just like cash; they are dollar-for-dollar cash equivalents and according to Disney’s website, happen to be the official currency of The Disneyland Resort, Walt Disney World, and The Disney Store locations in the United States and Puerto Rico. 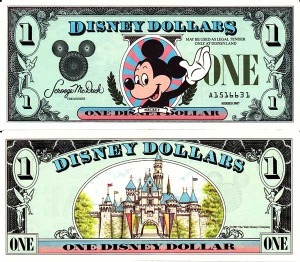 *The first Disney Dollar design, circa 1987. 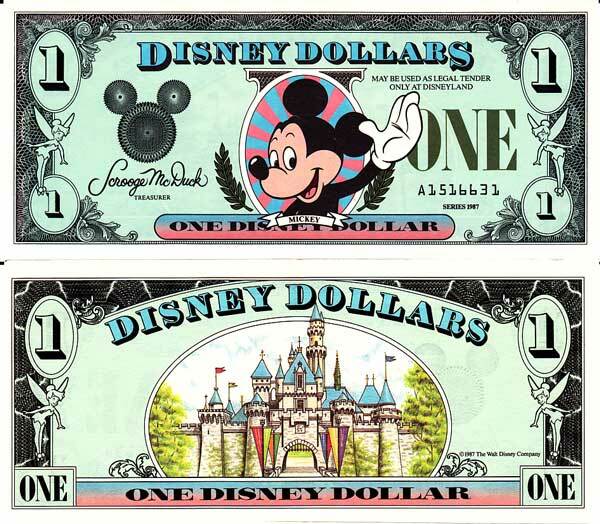 Since 1987, with over 25 years of the Disney Dollars’ circulation, there have been many design changes to the bills. It could be for a commemorative date, such as Mickey’s 80th birthday, a celebration like the opening of The Disneyland Resort in California, or for advertising a movie like Chicken Little and the Pirates of the Caribbean movie franchise – they all have been reflected on the currency. Denominations that have been released include $1, $5, $10, and limited edition $50 (2005) bills. We’ve seen Mickey and Friends, Villains, Princesses, Pirates, and even park attractions grace the front and back of each Disney Dollar. Currently, the only denominations available for purchase are $1, $5, and $10. Just know that when you purchase something less than the amount given, you will get change back in regular US currency. Aren’t they awesome? My favorite feature on those bills would be the “pixie dust” sprinkled along the left side of each note. It has just enough sparkle! 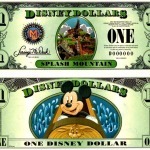 Disney Dollars are available for purchase through U.S. Disney Park locations. Guests can purchase them at the front desk of Disney Resort Property hotels, Theme Park Guest Relations, or the World of Disney Stores (both coasts). *Note that there will be a $15 shipping charge added to your order. We advise that you call the number above to confirm all pricing prior to ordering or sending any money. Where can I spend Disney Dollars? 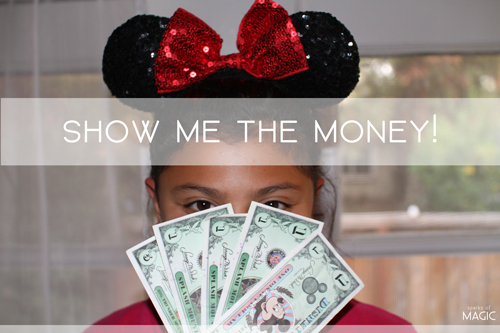 How can I use Disney Dollars (besides spending them)? Not only do Disney Dollars make great gifts, but they are wonderful motivational tools for little ones for accomplishing household chores, or as rewards for report cards. 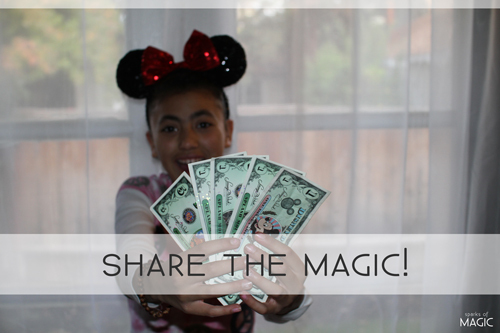 If you give your children an allowance for chores that earn them cash and know you’ll be taking a trip to the Disney Parks in the near future, perhaps consider paying them in Disney Dollars. One of the money-saving tips that I can share is to let them purchase their own souvenirs. Not only will they learn the value of their magic dollar, but they’ll learn to budget and save, which will keep you from dipping into your own budget during the trip. They’ll feel pretty empowered to have “their own money,” and you’ll feel better spreading out your spending money and making a plan before you go. 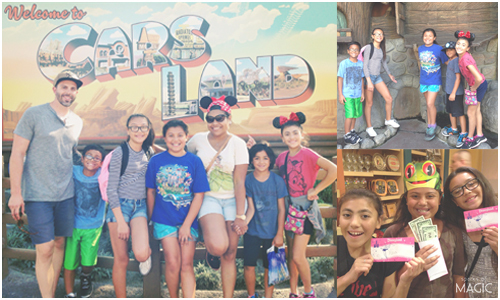 Disney Dollars are a great way to commemorate a special trip to the Parks, collect for nostalgia, or purchase for rewards or gift-giving. Now is a great time to purchase Disney Dollars as the holiday season is upon us! I’m sure there will be plenty of boys and girls of all ages who would be excited to find Disney Dollars in their Christmas stockings! We are excited to see what designs will be released next, and look forward to collecting Disney currency that really is priceless. Be sure to follow Camille’s other magical adventures and stories on her blog Sparks of Magic! 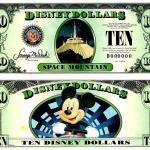 How about you, are you familiar with Disney Dollars? Do you have a favorite design? Let us know in the comments below. Camille, I love Disney Dollars! As a travel agent, I have a supply on hand to send to my clients for a little surprise. Great post, thanks for sharing with us! When my daughter lost her tooth at WDW, we had the “tooth fairy” give her Disney Dollars. They were so easy to get at the hotel gift shop and were a magical surprise for her.